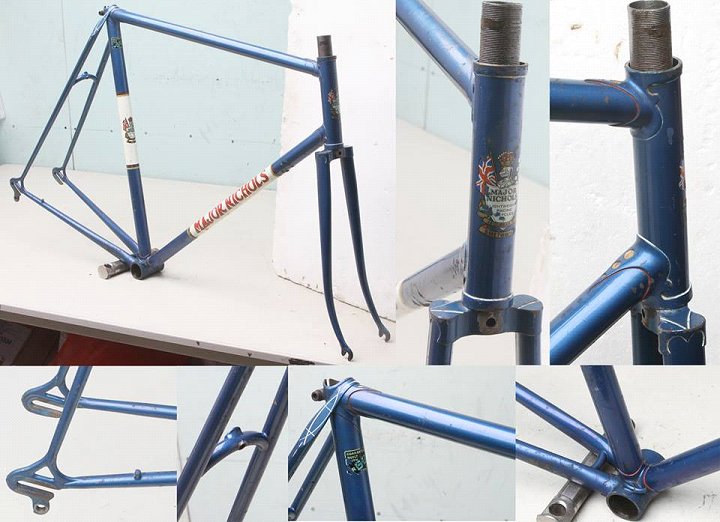 Hilary Stone sold this top end frame and this is what he had to say about it. I missed seeing it but was told about it and picked the details up from an open source. Full credits to Hilary for the photos and his accompanying description which is less myopic than mine that follow on from it! In 1973 and 1974 a number of very similar frames have turned up all clearly custom built to the same exacting quality as this one. The fork crowns vary as do the Prugnat less common lug patterns which are all long spearpoint. If the new owner would provide the rest of the frame number, in confidence if required, we would be very grateful. The frame has been built in Prugnat long spearpoint lugs in one of the less commonly used patterns with drillings beautifully refined. Braze-ons are minimal, a typical feature of his top fames in this period. Just a rear BB cable guide and cable stop which makes me speculate that the frame was primarily intended for time trials. Many competition riders preferred a clean frame to be able to change equipment and setup. Curved reinforced seatstay bridge and curved chainstay bridge. Full wrapover seatstays. The fork crown is a Vagner DP+lozenge fraise’ pattern. Dropouts look to be Campagnolo. The frame is in original finish, a mid blue metallic, with white panels on head. seat and downtube There are the Durban Road flag and shield transfers on head and seat tube panels and red with black outline gothic script Major Nichols in the downtube panel. The seat tube has a Reynolds double butted transfer. The double fishtail motif on the topeyes is in white and a good example of the period for refinishers to note. Luglining in red, light blue and white with gold drilling infill. World Championship bands. The paintwork is not perfect but could be carefully touched up and conserved as it is an original finish.